My name is Anatoly Yunitskiy. 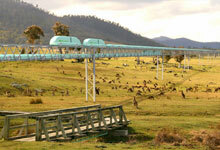 I am an engineer, author and General designer of SkyWay transport systems. 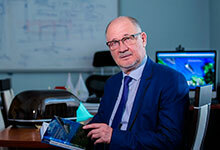 Today, this breakthrough technology is embodied in SkyWay transport and infrastructure complexes at EcoTechnoPark (Maryina Gorka, Republic of Belarus), with which the Group of companies I lead is entering the world market. 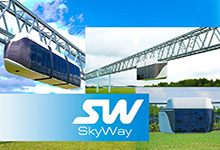 The solutions embedded in the basis of SkyWay systems have a global transformational potential, aimed to set up the foundation for a safe and harmonious development of civilization for a long time to come. Here, in my personal website, I am going to explain what my inventions and my SkyWorld program are. Factories, power plants, machines, vehicles, etc. 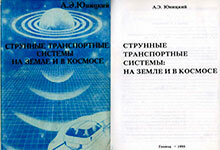 are the analogues of living organisms in the biosphere. 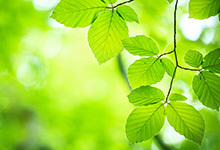 Similar to living organisms, they exchange energy and materials with the environment; therefore, similar to organisms, they inevitably transform the Nature. In fact, from the biological point of view, it causes environmental pollution. 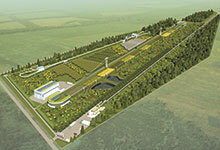 However, from the technological point of view, factories and power plants do not pollute anything. They have raw materials and maters at the input, and at the output  finished products (including energy, for example, electric one, and a service, for example, transportation one) and a converted initial raw material (excluding finished products), which of course gets into the same area where it was taken from  the environment. It is impossible to avoid it in principle. The creation of closed-loop technological cycles to solve environmental problems in this way is fundamentally impossible, either. It is about the same if we, let us say, try to look for a way to prohibit a cow to produce manure, urine, methane and CO2 along with milk. Even the biosphere as a whole is not a closed system. In fact, it transformed the Earth, which was earlier dead. Only the "Earth  Biosphere" system is a closed one. Similarly, the technosphere, not an individual plant or factory, cannot be a closed system under the conditions of a particular planet. The technosphere will be inevitably transforming the Earth. But in what direction? The technosphere does not need the oxygen-containing atmosphere. Already today the industry of the USA and China consumes more oxygen than trees and plants in these countries' territories produce. They live on credit consuming the oxygen generated by the Russian taiga and the Amazon rainforest. What will be, if all countries achieve that level of industrial development? The technosphere does not need soil. Therefore, increasingly less fertile soil is left on the planet, however more and more dross, ash and slag heaps appear. Acid rains, smog, high level of radiation, destruction of the ozone layer, etc.  all this is inevitable. It is only possible to slow down the process of transforming the earth nature, the biosphere, but there is no way to stop it. The technosphere occupies the same ecological niche as the biosphere as a whole: machinery, mechanisms, technological devices are located in the depth of the earth, water, air and are actively exchanging energy and materials with them. Ecological problems rose sharply in the last quarter of the twentieth century for the reason that the technosphere got close to the entire biosphere in terms of its power supply capacity, i.e., by its ability to transform the environment. For instance, the biosphere now generates above 200 billion tons of dry organic substance per year, which in terms of fuel is by only ten times more than the annual power consumption by all the machinery available at the disposal of the terrestrial civilization. Meanwhile, the volume of soil, ore and raw material transported and processed by machinery has closely approached the volume of organic substance produced by the entire biosphere. There is only one drastic way out of the current situation: it is necessary to provide the technosphere with an ecological niche beyond the biosphere. This will ensure preservation and development of the biosphere in accordance with the laws and directions that have been formed during billions years of evolution, as well as a harmonious interaction of the people's community as biological objects with the biosphere. There is no such an ecological niche for the technosphere on the Earth. However, it is available in space, where there are ideal conditions for the majority of technological processes: zero gravity, vacuum, high and cryogenic temperatures, unlimited raw, energy and spatial resources, etc. Humanity does not have much time for a large-scale space exploration. In aviation, there is the concept of a point of no return  the moment after which the aircraft has no longer enough fuel to go back and the catastrophe will be inevitable. According to my estimates, there are only two or three generations, 4060 years up to the point of no return in the development of our technocratic civilization. Nothing can restore the disturbed balance between nature and industry after that. Because of the technocratic oppression on the biosphere, it will begin its irreversible destruction and degradation, and the degradation of the human race with it. After all, our earthly civilization lives by the principle "Mould in Petri dish"  having eaten all the limited resources, it will perish. To change the attitude to itself and to nature is the most difficult task that humanity should fulfill in the very near future. Sorting and processing of household and industrial waste, transfer to the use of renewable energy sources, global programs aimed at reducing CO2 emissions into the atmosphere  all this is being done today, but this is not enough. They also start speaking about bringing the industry out into space, for example, Amazon founder Jeff Bezos recently said about it, but they do not say how to carry it out. They do not say because they do not know how. I not only know, but I am doing it  today, now. SkyWay overpasses are structures pre-stressed with tensioning. It is for this reason that the transport is called a string one. 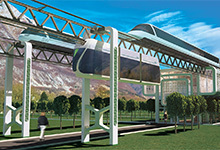 For the same reason, SkyWay proves to be the most economical and efficient version of a transport overpass, because among the four types of materials in stress-strain state: stretching, compression, bending, twisting,  the most favorable is stretching in terms of the most complete use of physical and mechanical properties of materials. 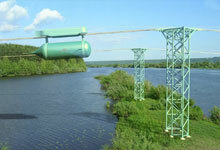 For example, with an equal payload, a stretched cable with 10 cm diameter and 500 m length is a structure that is a thousand times less material-intensive than the Ostankino TV tower or a motor-road bridge with a span of 500 m, which is subjected to bending. An overpasses consist of anchor supports accepting horizontal load from stretching and installed with a span of up to 5 km, intermediate supports located at a distance of 502000 m and more from each other, and thin composite string rails. Thus, the rail track, along which an electric car runs on steel wheels, can be at most light, durable and smooth, which ensures high speed and comfort of traffic. At the same time, if you make a track structure continuous, without extension seams along the whole length, then it is possible to increase the bearing capacity of the overpass twice. The small diameter of the composite string rail and its location above the ground at 5 m height allow to get rid of the so-called airfoil effect, which degrades the aerodynamic properties of transport when driving at high speeds at least twice and, as a result, increase the power consumption proportionally. The essence of this effect consists in a sharp increase in aerodynamic drag near the screening surface (earth, water, roadway) due to the dynamic air blowdown under the bottom of a vehicle. 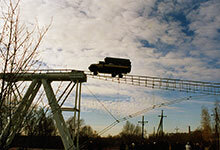 Nothing like this occurs in SkyWay systems, as there is no screening surface  the rail is actually stretched in the air. 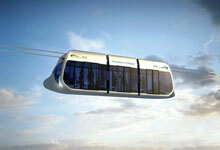 At speeds above 350 km/h (and SkyWay string transport is being designed for speeds up to 600 km/h), removal of the airfoil effect becomes one of the decisive factors, since in these speed modes more than 90% of the drive power is spent to overcome air resistance. The remaining 10% of the power is spent to overcome the rolling resistance of the wheel. In SkyWay, the "steel wheel  steel rail" support system is used having the efficiency factor of 99.8%, since it is possible to move a bogie weighing one ton along a horizontal rail track with a force of two kilograms. At high speeds, losses here are two orders of magnitude lower than those in the system "pneumatic tire  asphalt-concrete roadbed" and several times less than in other systems  with air and magnetic cushion. 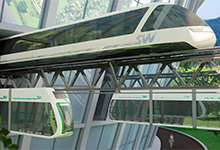 The unmanned rolling stock in SkyWay runs along a string-rail overpass elevated above the ground, beyond the zone of possible collision with other vehicles, people, animals and other objects, which additionally increases the level of traffic safety and opens the possibility of all-weather operation by excluding the so-called human factor. 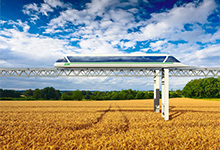 The same aspect  movement of rail vehicles above the ground  combined with an unprecedentedly low level of energy consumption (up to 1 liter in fuel equivalent per 100 km at 100 km/h speed) makes SkyWay transport complexes friendly at most to the environment. The land under the tracks can be used for creating parks and farming. Natural biogeocenoses and migration routes of animals can be preserved in the extensive territories on the way of track construction. The hydrology of soil will not be disrupted, as it happens in case of building roads and railways today. 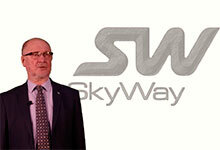 The maximum effect at minimal expenses is the basic principle for the operation of SkyWay transport, which should be the same for any other transport system. However, in reality modern transport works in a completely opposite logic. The service life is specially reduced in the interests of giant producers and component parts dealers, energy consumption is steadily kept at a high level, profitable for miners and hydrocarbon processors. The road infrastructure needs constant expansion due to the continuous growth of the number of vehicles. Most of them occupy the urban space without performing any useful work  just standing in a parking lot. Such a model demonstrates its utter futility. SkyWay looks absolutely preferable on this background. Now that its affordability, effectiveness, cost-efficiency, safety and speed are confirmed in practice, you can be sure that the future belongs precisely to this mode of transport. On confirming the efficiency of SkyWay technology in Belarus, we are beginning its commercial implementation in one of the richest regions of the world ready to transformation  in the Middle East. With the support of the government of the most innovative country in the world, the United Arab Emirates, we are creating a world center for the development and promotion of our breakthrough transport and infrastructure technology  "String Valley", an analog of Silicon Valley in the USA, where not only all SkyWay transport technologies will be tested, but also the associated infrastructure technologies. Work on them is carried out in parallel. 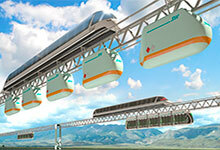 These are linear cities, new "green" power generation, relic fertile soil, vacuum glass and much more. As soon as we start the first construction in the UAE, target contracts will be opened in many countries, for which funding will flow in. There are dozens of such projects today, with a total length of several thousand kilometers totaling for the amount of more than USD 10 billion. These are cargo, urban and intercity routes in the Emirates, Saudi Arabia, Egypt and other countries of the Middle East and even in Brazil situated far from the Emirates. 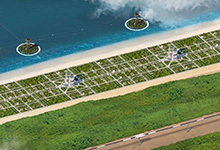 Thus, in the UAE, we will build not just some test sites, but innovative technological platforms in which we will create all the related infrastructure that is required and sufficient for us to become world leaders in SkyWay transport and infrastructure technology, namely: research and development; educational; operational; project designing and production ones for batch manufacturing, not only for pilot production, as in Belarus. We will have there our own solar power generation  linear, stretched along the route, and much more. And all this is the golden key to orders and financing of a large number of projects on all continents and transformation of the world in accordance with the objectives and potential of SkyWorld project. 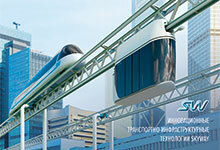 The complex of works to create the first samples of SkyWay string transport systems and introduction of SkyWay transport to the market are financed according to the modern model of crowdinvesting  public financing. While the project is at the startup stage, everyone can become its investor. The amount of investments starts from only USD 50, but thanks to a large number of project participants, this scheme allows to generate sufficient funds for the development of the Company at the initial stage. All investors are co-owners of the technology underlying in the basis of SkyWay transport and future shareholders of the Company that, according to expert estimates, is capable of winning up to 50% of the world transport services market in the foreseeable future. The use of the crowdinvesting scheme makes the project unique. For the first time in history, the financing of works on the development of a sector-making technology is carried out by ordinary people. 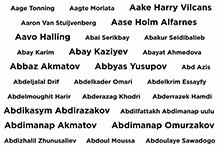 The project participants are about one million people from more than 200 countries, of which more than 200 thousand have already become investors. 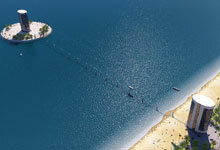 It is the geography covering the entire populated part of the planet. We are getting more of them every day. This imposes a great responsibility on me and the team I lead, but at the same time it's a great honor  an unconditional confirmation that the program that I am implementing is really comprehensive and necessary for people. It is in the interests of ordinary people, humanity, not officials and raw material monopolies, that SkyWay string transport is developing. Public financing has become a powerful impetus to the changes that SkyWay transport brings about with it and which the power holders can no longer neglect. Previously, they were not interested in changes that could disrupt the established balance of power. I got convinced of this by my personal experience, having spent decades trying to convince them of the need for radical changes, on which not only the fate of their children and grandchildren depend, but also that of humanity as a whole. At the same time, 40 years of struggle have refined my arguments, allowed me to work through all the components of technology in detail, leaving behind three generations of string transport and laying the foundation for the fourth generation. With the support of the "army" of investors, I made the first decisive step  the creation of full-scale operating models of SkyWay transport systems. Now that everyone can see firsthand the efficiency of the transport and infrastructure solutions that I have proposed, both governments and businesses are forced to accept changes as a fact and struggle to be among the first to promote them. Few want changes, but when the changes come, it's about everybody and everyone has to make a simple choice: change himself or die. Everyone who will be on our side will be the winner, those ones who become our investors, may be among the dollar millionaires already tomorrow. As noted above, the Middle East, the cradle of ancient civilizations, is expected to become a starting point, as it is completely ready to be the epicenter of a new passionate impulse. 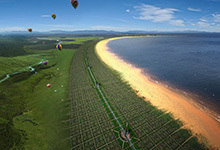 Further on, SkyWay transport should encircle the planet including the water thickness along the ocean, which is technically feasible and allows to ensure more affordable, in comparison with aviation, and much faster communications between continents (with speeds up to 1,250 km/h after building forevacuum tunnels) in comparison with water transport. 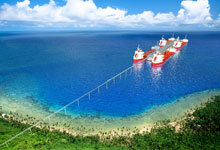 On the continents, SkyWay overpass is fixed with supports, in the ocean  on anchored floats, installed below the water surface. The key route should be a hyper-speed SkyWay route encircling the ground along a line parallel to the equator, for example, along the Northern Tropic, or vice versa  along the Southern one. Then the project will be able to enter a new stage  construction of a General Planetary Vehicle (GPV). The SkyWay overpass encircling the globe will be its launch pad. The cargo-and-passenger version of the General Planetary Vehicle (GPV) described by me in popular science articles as far back as in 1982 (all-Union journals "Inventor and rationalizer", No. 4, and "Technology for the Youth", No. 6) is arranged as follows. Imagine a special tube  the GPV bearing body frame  with a diameter of about two meters installed on the overpass and extending in both directions beyond the horizon and, thus, seizing the planet in a plane parallel to the plane of the equator. Two linear rotors, also seizing the planet, are installed inside the tubular body frame. The rotors are located in vacuum channels and have magnetic suspension systems and linear electric motors. At the first stage of space entry, a magnetic suspension system is activated stabilizing the rotors in the centers of vacuum channels. Then one of the rotors is driven by a linear electric motor in motion along the channel, and, accordingly, around the Earth. The mass of the rotor is considerable, millions of tons, therefore many days will pass before it reaches the first cosmic speed and, by balancing the Earth's gravity force with the centrifugal force, will attain zero gravity. When the speed reaches more than 10 kilometers per second, the centrifugal forces will exceed the GPV weight. Under the action of centrifugal forces exceeding the Earth's gravity force, the self-carrying ring of planetary dimensions is detached from the Earth's surface and, evenly stretching (it will be 1.57% for every 100 km of the rise,) leaves the planet's atmosphere within a few dozens of minutes and completely enters the circular orbit in the equator plane. While braking the first flywheel accelerated to cosmic speeds, the generated electric power is switched over to accelerating the second flywheel in the opposite direction. Having received a double impulse, the GPV body frame, seizing the planet, starts to rotate around it, until it develops the first space velocity in a few hours. The space cargo on the external suspension (passengers in comfortable cabins and a variety of goods in special containers) will be brought out in this way to circular orbits at an altitude of 300400 km. After the GPV starts operation, the industrialization of outer space will begin. 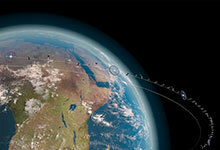 The need for geospatial haulage will increase dramatically. This need will be satisfied by increasing the frequency of launches  after all, for one voyage, about 10 million tons of cargo and 10 million passengers will be delivered into space, environmentally friendly, without any impact on the environment, at the cost of less than USD 1,000 per ton, that is with a 10,000-fold decrease in the cost of delivering goods into orbit compared to today's costs. 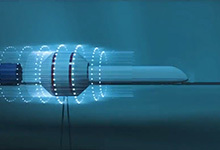 As for the resources that are available at the disposal of mankind, GPV can be built already today: the cost together with infrastructure is USD 2.2 trillion (three annual US military budgets), the capacity to switch to the power grid is 100 million kilowatts (2% of the rated capacity of the world's power plants), the weight of metal structures is 40 million tons (so much steel is produced on the planet for a couple of weeks). Many new opportunities will open up for humanity even at the stage of mass adoption of SkyWay terrestrial transport systems. 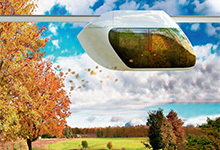 The transfer of transport flows to the "second level" above the ground will allow to free up huge areas, now occupied by highways, and restore them with the help of biotechnologies developed by us in parallel with SkyWay transport. These same technologies will make it possible to enrich the soil in areas that are now unsuitable for agriculture, primarily in deserts that occupy a significant part of the Earth's surface. The speed of transporting passengers and cargo will significantly increase, which will provide a great impetus for social and economic development. 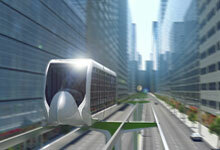 Linear cities will begin to appear along SkyWay high-speed lines. They will be created in a fundamentally different logic than the current settlements  pedestrian, environmentally friendly, affordable, safe and comfortable for living. After the implementation of GPV, a large-scale industrialization of near-Earth space will begin, where, primarily, a powerful electricity-producing industry (about a billion kilowatts) will be created in the first ten years. This will allow starting to mothball the most environmentally hazardous power plants (nuclear, thermal and hydroelectric power stations) and the most polluting fuel processing industry on Earth. The availability of huge amount of energy in the orbit will allow to transfer almost all the resource-extracting industry into space (to the asteroid belt and the Moon) for several dozens of years: metallurgy, major chemistry and other types of environmentally hazardous sectors, as well as industries that need weightlessness, vacuum, radiation, cryogenic and ultrahigh temperatures. At the same time, the ecology of the space environment will not be violated, since the concept of "ecology" loses its meaning in the outer space due to the absence of life there. The described program may seem like a utopia to many, as it will require considerable intellectual, financial and material expenses, while there are a lot of unresolved problems on Earth today. But I am convinced and hundreds of thousands of SkyWay investors from 200 countries of the world support me in this, that in the future the funds will be invested in the thing that will save the civilization, in our children and grandchildren, and will not be spent for the barbaric devastation of the planet's interior, weapons of murder and arms race, as it is happening all over the world presently. 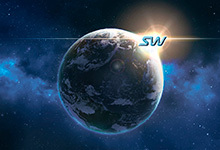 The implementation of SpaceWay program has already begun and it is gaining momentum. Today we have reached the point where it is actually impossible to stop us. Soon we will bring out SkyWay string transport into the market and get at our disposal the resources of one of the world's largest transport and infrastructure companies. 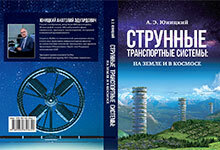 And me personally, I intend to invest all the funds received from the implementation of SkyWay projects in the development and creation of SpaceWay General Planetary Vehicle. 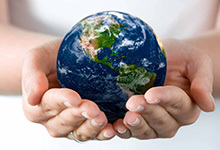 I am convinced that there is simply no other way of development for the earthly civilization. Therefore, my motto is: build SkyWay  save the planet! Please find out details of participation and join the project at rsw-systems.com.